The molecules upon which an enzyme acts are called its substrate. For example, cellulose is broken down by enzyme cellulase, therefore cellulase is the substrate. The active site of enzymes is a complex three dimensional-cavity into which the substrate molecule fits. At the active sites the enzymes work by lowering the energy of activation. The enzymes are far larger molecules then the substrates they act on. Only a very small portion of enzymes, between 3-12 amino acids, comes in direct contact with the substrate in the enzyme substrate complex. This is active site of enzyme. 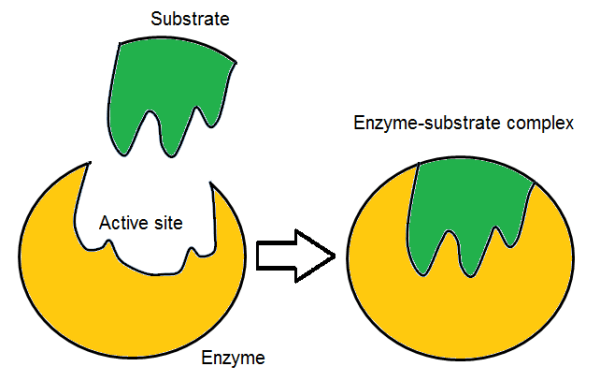 The active sites of enzyme have shape and charge complementary to its substrate. The active site is formed by interactions of R-groups of amino acids in a polypi: de chain. For example, in lysozyme five amino acids at positions 35, 52, 62, 63 and 101 out of linear sequence of 129 amino acids provide their R groups to form its active site. Enzymes work by reacting with their substrates to form a short-lived enzyme substrate complex before yielding the products. Studies on kinetics of enzymes confirm the formation of enzyme substrate complex. The complex is formed at active site of the enzyme. The complex breakdown to form the product (s), leaving an unchanged enzyme molecule which is then available to catalyze another substrate molecule. 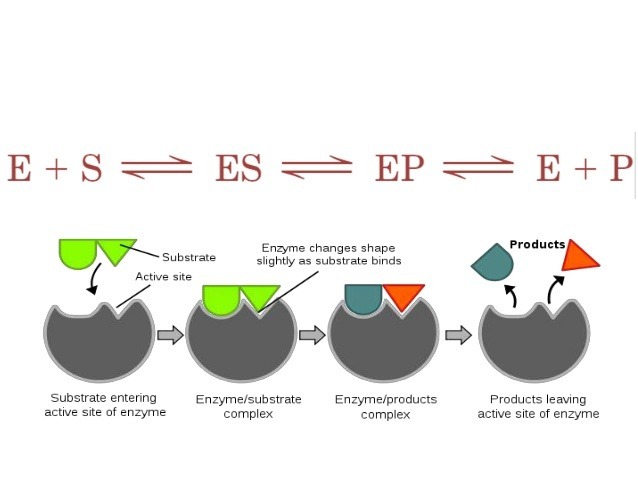 The formation of enzyme substrate complex was first hypothesized by Emil Fischer in 1884 and offers a good explanation of the enzyme specificity. The formation of a complex (ES) between the enzyme (E) and substrate (S). k3 = rate constant for conversion of S to P.
Michaelis and Menton are also credited with the first mathematical study of the relationship between substrate concentration and reaction rates. They introduced two particularly useful mathematical expressions that for any enzyme relate IS] to V (velocity) and permit quick comparisons of various enzymes catalyzed reactions. These two expressions are called Michaelis-Menton constant and Michaelis-Menton equation. Two models were proposed two explain how Enzymes work and how active site of an enzyme selects its substrate out of thousands of molecules present in a cell. Enzymes are highly specific in the reaction the catalyzed. Some enzymes catalyze the transformation of one particular type of substrate molecule or, at most a very restricted group of substrate molecules; some catalyzes only one type of chemical change. This degree of specificity distinguishes enzymes from other types of catalysts. The specificity 4 enzymes are due to the configuration of the active site. This idea was originally developed as the lock and key model hypothesis. The substrate is the key that fits exactly the enzyme lock. The lock and key model of enzyme action was proposed by Emil Fischer. According to this model the substrate has polar (positive and negative) and non-polar (hydrophobic) regions, therefore, it is attracted to and associates with active site which is complementary in both shape and charge distribution. The active site of enzymes can be compared to key and substrate to a lock. A specific key can open a particular lock, similarly a substrate having complementary shape and charge to the active site can fit into the active site, and is catalyzed by the enzyme. 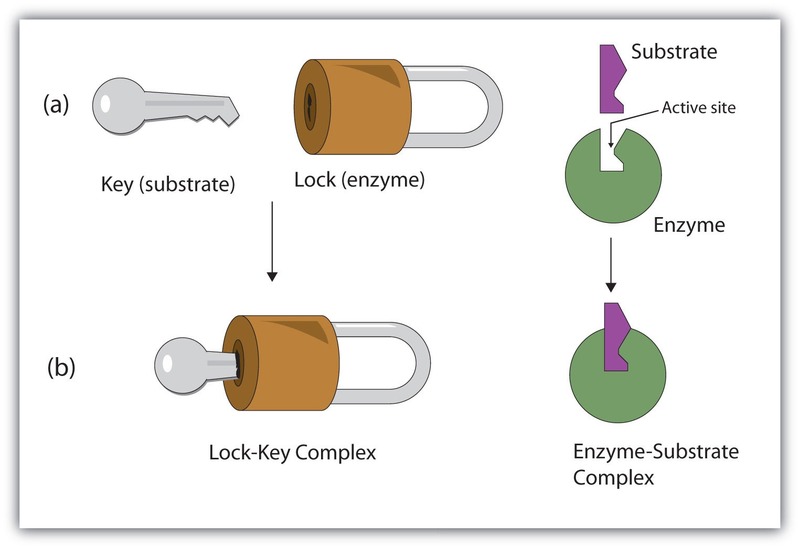 The lock and key model for enzyme action accounts for enzyme specificity, because that lack the appropriate shape or are too large or too small cannot be bound to the active site. Evidence from protein chemistry suggests that a small rearrangement of chemical groups occurs in both the enzyme and the substrate molecules when the enzyme substrate complex is formed. It is suggested that strains of these changes may play a part in the catalytic process; it may help induce a chemical change. This suggestion, which is called induced fit model hypothesis, seems to offer a better model to explain enzyme action. According to lock and key model of enzyme action the active sites are rigid and specific for a given substrate. Thus, reversibility of reaction cannot occur because the structure of the products is different from that of a reaction and these will not fit into the active site. But it was found that in number of cases compounds other than true substrates bind to enzyme, though they fail to form the end products. In 1973 Daniel E. Koshland proposed that the active sites of enzymes do not initially exist in shape that is complementary to substrate but are induced to assume the complementary shape as the substrate becomes bound. This idea is widely known as induced fit model hypothesis. According to Koshland the enzyme active site is flexible. The active site and the substrate initially have different shapes but becomes complementary on substrate binding. The shape change brings the catalytic residues in positive to alter the bonds in the substrate, following which the product is released and the active sites return to its initial state. However, that molecules that are large or smaller than the true substrates or that have different chemical properties do not bound to the active sites and do not induce it to change its conformation.